This Thanksgiving I am going to be hosting a large crowd again which is always lots of fun. What isn’t always lots of fun is getting food all over me when I am cooking. To help keep my clothes a little neater I decided to make myself a new apron. 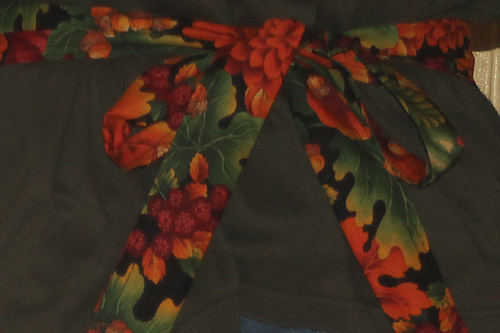 I thought it might be fun to use one of my old maternity T-shirts for the main part and a small scrap of Thanksgiving fabric for the ties. What resulted is a simple, yet functional apron. 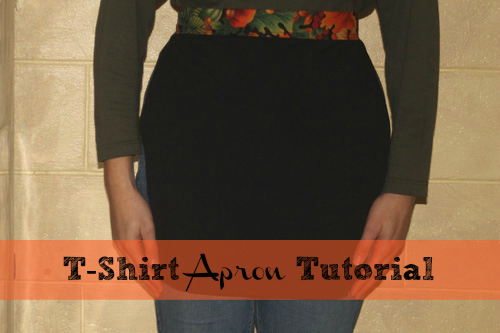 If you would like to make a simple half-apron, and you have an old T-shirt lying around, here is what you will need to do. 1. 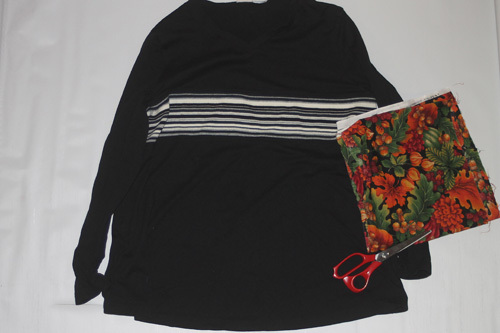 Cut the T-shirt just below the sleeves and cut up the sides so you have one large piece of fabric. I used the back of this shirt since the stripe on the front wasn’t going to match my fabric. Be sure to save this fabric for another project, though. 2. 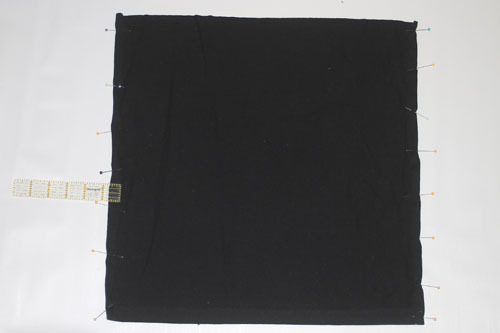 Measure the fabric and “square it up” to a size of 18 inches high by 19 inches wide. You can make yours larger or smaller, but this seemed to be a good size for me. 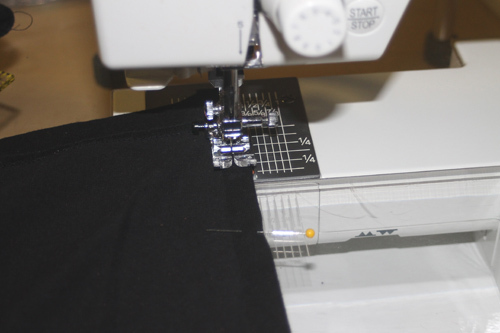 The hem of the T-shirt will be the hem of your apron. 3. Fold the 2 sides of the T-shirt towards the back 1/2 inch. Pin in place. 4. 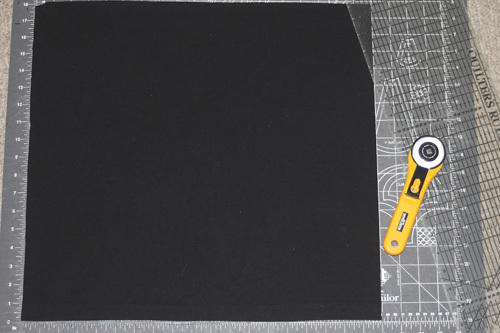 Sew along the sides you pinned in Step 3 using a 1/4 inch seam allowance. It is helpful when sewing with knits to use a ball point needle and to set your stitch length slightly longer than for regular fabrics. 5. 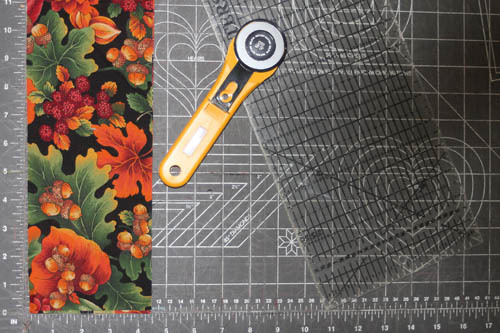 Cut the coordinating cotton fabric to a width of 4 1/2 inches by 84 – 86 inches. If you don’t have a piece of fabric that long don’t worry. Simply sew two shorter pieces together and treat them as one piece . 6. 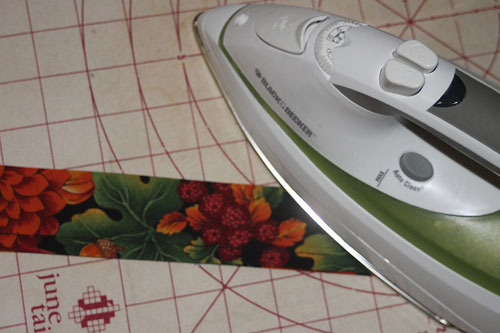 Fold all sides of the fabric towards the back 1/2 inch and iron as you fold. 7. Fold the piece of fabric in half lengthwise with wrong sides together so that all of the folds you made in Step 6 are inside. Use an iron for this step. 8. 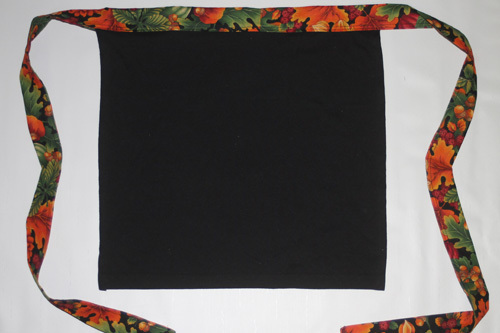 Find the center of the T-shirt fabric and the center of the coordinating fabric. Open the coordinating fabric and place the T-shirt fabric inside with the raw edge even with the fold line. Pin in place. 9. 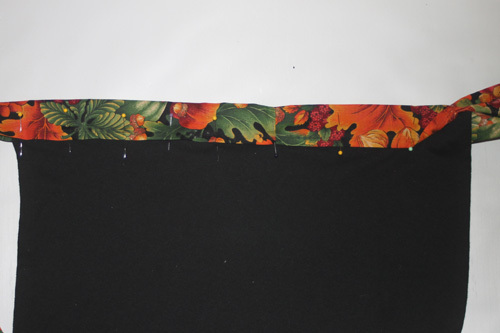 Sew along all open sides of the coordinating fabric using a 1/8 inch seam allowance. 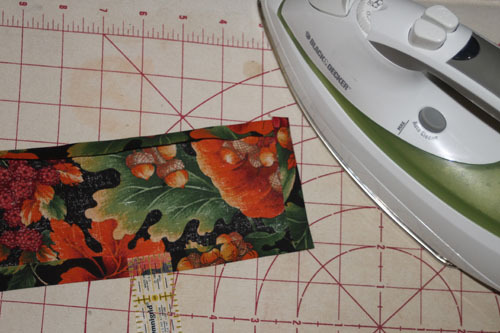 You will not need to sew along the fold line, so you will be sewing on only 3 sides of the coordinating fabric. That’s all there is to making this simple apron. Here is how the apron looks from the back just in case you were curious. The ties actually hang down longer than this so there should be enough play to accommodate most sizes. I definitely think I am going to go through my bag of old T-shirts and make more of these for myself and for my daughters. It would even be fun to use a T-shirt that had a design on the front. Oh, the possibilities are endless. Do you wear aprons? Would you wear an apron like this? Yes, I wear aprons. No, I probably wouldn’t wear an apron like this. When I choose an apron, I want one that covers the top of me and is heavier weight. I am a terrible hand wiper (or is that really good one?) 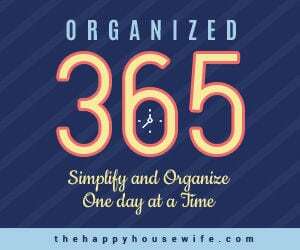 and really give my aprons a workout. I also tend to splash up, so I really want that upper coverage. I like heavier weight cottons, so if I were using this idea to make an apron from a T-shirt I would probably use both the front and back doubled up as one layer and the sleeves opened up to make the top. I’d also use some of the coordinating print fabric to make a pocket or two at hip level and an applique at the top. I like your ideas, Dineen! Thank you so much for sharing. I wear and used to make aprons all the time. They make awesome gifts for men and women. My favorite thing to do is find a flat sheet on sale for next to nothing and just lay an apron on top and trace it with a pen. I then double or even triple the sheet, pin the inside of the apron and cut. Hem the bottom and 2 sides up to the curve. Take a complementing seam binding and go across the top strip. Take the binding then and leaving 15-20 inches free cover the side from the top of the side hem to the top strip on the corner. Either measure the length you want for your neck or just cut enough to tie. If leaving the neck solid, starting after teh neck attach to the other side and continue to the top of the side hem and leave the remaining 15-20 inches hanging again. back stitch or zigzag multiple times at the top and bottom of the sides to reinforce. 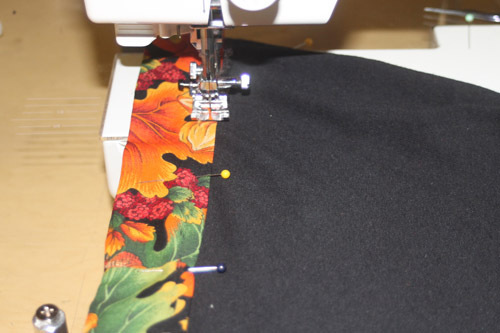 Close up the long tails by stitching or using fabric glue. Stitching is suggested if this will be used very often. 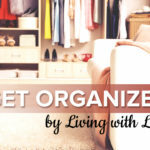 Applique, embroidery or paint to personalize it. Or if the sheet was pretty enough, leave it as is. I have gotten 4-7 aprons out of 1 king size sheet before. Just don’t use faded old sheets for the gift ones! If they have a pretty hem, cut as many as possible where the hem is to add that special touch. Getting the no wrinkle sheets is a big plus! Thank you so much for sharing your great apron sewing ideas, Susan!! !